a paranormal romance: My Forbidden Desire, which was released this Tuesday (May 26). Click here to read the rest of the interview and win the book! 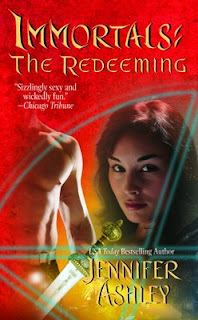 I was so pleased to get word today that Immortals: The Redeeming finalled in the Prism contest (paranormal chapter of RWA). Very nice!! I am a double finalist, actually, because Allyson James (one of my other selves) finalled for The Dragon Master. Different category, so I don't have to beat myself up if I win. And light candles to the tech gods that it gets resolved soon. I'm seriously annoyed (as are those of you waiting for the Kindle version), but candles and chanting is about all we can do for now. Thank you for your patience. Kindle version of Lord Ian? I've been getting many questions about when the Kindle version of Madness of Lord Ian is coming out, and here's my answer: I don't know!! Apparently, the more interest Amazon gets, the faster the Kindle version will be put up. I truly don't know what is up with the Kindle version. My other books have come out in Kindle almost right away. In fact, this is only one of the frustrating release problems with this book; there have been other fiascoes. But hey, if the clicking works, I'm all for it! So if you want Kindle, please go click! Today I'm at Night Owl Romances with something a little different--a "virtual" booksigning. How it works: If you purchase any of my books today (online or in a store), stop by the site, fill out the form (it explains how you do a proof of purchase), and I send you a goodie package, with includes my autograph. Any of my books are eligible, purchased wherever you shop--only new copies, not used. Tammie at Night Owl has done a few of these, and I hear they're great fun. So stop buy, get a book, and get some goodies! Today I'm over at Romance by the Book, talking about Ian Mackenzie and AS, and heroes who can't say "I love you." Come join the chat for a chance to win a free copy of Madness of Lord Ian Mackenzie! I'm at PopSyndicate today, chatting with Angela Wilson. Stop by, say hi, win stuff. Giving away more books, of course! These ladies keep up a great blog, so stop back and read their insights on publishing and what's hot in fiction today. I have four more blogs before I'm done with my "tour" so keep trying for a chance to win! Very cool: B&N's "Long List"
The Madness of Lord Ian is featured today on B&N's "Long List": 50 books, DVDs, CDs from all genres that are recommended reading/viewing. I've been hearing readers saying they are having difficulty finding Madness of Lord Ian, especially at Borders. I truly don't know what is up with that. I know (because I've seen it with my eyeballs), that it is well stocked at B&N and Walmart, and of course indie booksellers. Also, if it hasn't hit a Target in your area it should very soon. And there's always online. Thanks to the readers who have already emailed me about Lord Ian. I appreciate every single one!